Before even attempting insertion of the laryngoscope, put the patient’s entire occiput in the palm of your right hand. An assistant should be pulling the right corner of the mouth. Then use your right hand to gently elevate the head toward the ceiling (augmenting sniffing position) and extend the neck. 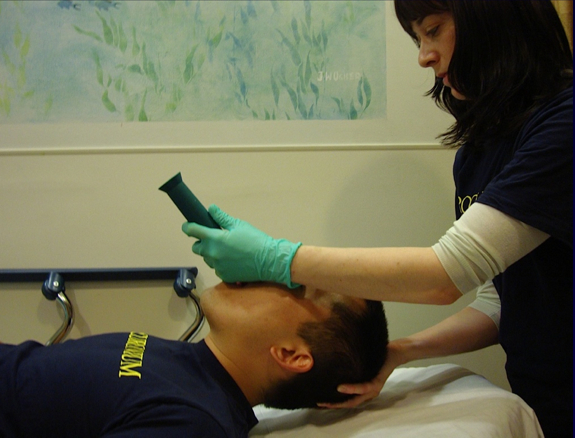 If the patient is adequately relaxed, this maneuver will open the mouth and open the angle between the neck and sternum (see pics below), facilitating easy insertion of the laryngoscope. Insert the laryngoscope blade and control the tongue. 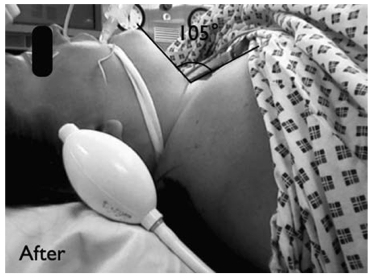 As you gently advance toward the epiglottis, continue to maneuver the head by (a) moving it toward or away from the ceiling and (b) extending or flexing the neck, as dictated by whatever maneuvers maximize your view of the glottis. Waldron S, Dobson A. European Journal of Anaesthesiology. 2010; 27:921. Dr. Waldron here describes the use of a 1 liter fluid infusion pressure bag placed under the patient’s shoulders as an easily adjustable implement to raise the head and extend the neck. Very cool. Especially if you’re short on assistants. 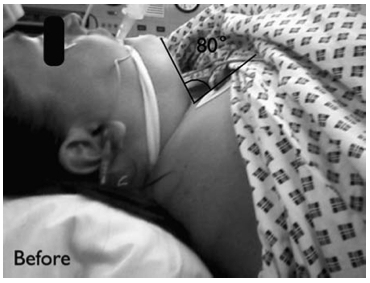 If you stuff a lot of sheets under the head of the patient before you begin, so that the head starts off significantly elevated compared to the chest, you limit what you can do with bimanual head optimization. I therefore recommend that when inserting the sheets, you position the ear somewhat posterior to the sternal notch, expecting that you will need to elevate the head during laryngoscopy.